When the first stalks of brussels sprouts appear at my local market in the fall, I greet them with the same enthusiasm as I do a basket of strawberries in the spring. I can finally bypass the staunch, yet stodgy broccoli and bring home a vibrant green vegetable that I’m excited to cook. I’ve always loved brussels sprouts, perhaps because my father always took such delight in them whenever we ate them growing up; the British, are, after all, the top consumers of sprouts, and my dad hails from across the pond. Brussels sprout lovers are aptly labeled, lovers, and most can wax poetic over the little green sprouts all the day long. Brussels sprouts are easy to identify because they look like little mini-cabbages, which just adds to their charm, if you ask me. These cruciferous vegetables are wonderful roasted, shaved, or on their own as a filling, flavorful side dish. I even add them to pizza and toss them on nachos for crunch and flavour. It’s fun to think outside the box. Brussels sprouts are in season for another few months, so let’s take a look at a few ways we can enjoy them during their peak. Look for bright green sprouts that are firm and dense. Choose sprouts of similar size so they cook evenly and go for the smaller heads (about 1 1/4 inches across) as they are usually more tender. Keep sprouts airtight in the refrigerator, (Ziplock bags work fine) and plan to use within 2-3 days. Rinse sprouts well under cold water (save that water for your plants!) and allow to drain briefly. With a small, sharp paring knife, trim the ends of the sprouts, and remove a layer of the outer leaves. Now you’re ready to cook! Here is a favorite dish that highlights this autumn vegetable, hopefully it will inspire you to add brussels sprouts to your menus this week. In a large sauté pan over medium high heat, warm olive oil and add pancetta. Stir often, until pancetta begins to brown and crisp. Add shredded sprouts and incorporate into the pancetta and oil, scraping up any bits on the bottom of the pan. Cook over medium high heat, stirring often, until sprouts begin to wilt and turn bright green, about 7-9 minutes. Squeeze the juice of a lemon over the pan, season sprouts with salt and pepper and taste. Sprouts should still be a little crunchy. 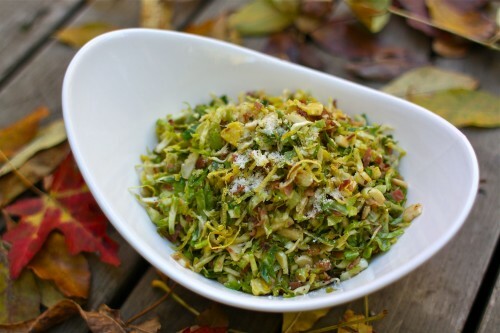 Remove from heat, and toss sprouts with butter, lemon zest, and Parmesan cheese. Serve immediately. How do you like your Brussels sprouts? Steamed, sautéed or roasted? We just picked up brussel sprouts at the market this morning and I’ve been thinking of them ever since. This week, I’ll saute them with a little butter (dairy free for us) and bacon. Lat fall my daughter picked them out at the farmer’s market because she loved the way they looked on the stalk. My kids didn’t care for them the first time we tried them but I really didn’t do much other than saute in a little olive oil. After a few weeks, we tried them again with margarine and some a pinch of salt – much better. A success! Now, they love them as much as I do. Kids, like adults, have their own lil’ tastebuds and we just need to find the right preparation to convince them to try something new. Now I’m working on eggplant! I can’t say my kids love them – yet. I only developed a taste for them around age 8, so I’m not giving up on my kids just yet! Oh my… I love Brussels sprouts. Like more than a human being should like a cruciferous vegetable. My quick way is to just chop them in half, toss with coconut oil or lard (yep, lard), and coarse sea salt and roast them at 425 until nice and crunchy. They’re also great in stir fries that start with bacon and sliced onions and end with a poached egg on top. I also like a recipe in Super Natural Cooking that involves pan-frying them until crispy and topping with parmesan. Oh… and I made the pumpkin cheesecake this weekend with stevia instead of sugar and ground almonds as the crust. It was amazing. Since we avoid sugars and too many grains we rarely get dessert, but with company coming I wanted something special. With hand-whipped cream spiked with cinnamon and stevia it was such a treat and loved by all. Thank you! Thanks for the suggestions, Shannon. I’m going to try them roasted with coconut oil this week. So glad the cheesecake was a hit! I agree with you – the brussels sprout is completely overrated. I think people remember boiled or steamed brussels sprouts and completely write them off without trying different cooking methods. There is so many more ways to cook this lovely veg! I’ve never had them before. However I almost bought some this weekend to cook with last night’s dinner. I ended up choosing swiss chard (which I’ve also never tried before). Those recipes do make me want to try them though! Love brussel sprouts the old fashioned way. Boiled till just done with a pat of butter and a dusting of fresh grated nutmeg. Yummmmo! I might give the first recipe a try this week though. I love brussel sprouts. One of my favorite veggie sides! Apparently I need to try these suckers fresh in order to truly appreciate them ;-). I grew up with the frozen-microwaved sort of brussel sprouts that would make any kid scringe. I’ll be scouting the market for these jewels in the next few weeks. Happy hunting; you won’t be disappointed, Steph. Well, my 8yo lives by the motto “It’s better with bacon”, so that’s what I use to entice him to eat brussle sprouts. We eat many a pancetta or bacon infused sprout in the fall and it works great for the kids. I, personally, could go with any of the above recipes though….they all sound so tasty. Did you use a food processor to shred your brussels? Love B sprouts – thank you for the yummy recipe. I actually don’t have a food processor, Courtney. I just use a chef’s knife, cut the sprout in half lengthwise, laid it down flat and chopped them up. okay – thanks – we’re giving the recipe a try tonight. Yum! 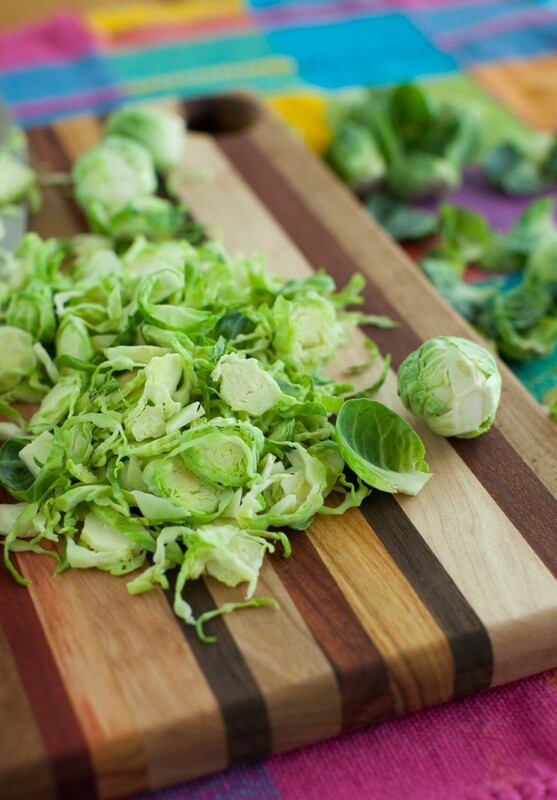 We love Brussels sprouts and these tips and recipes look great! Okay, so the kids kind of try to eat the pasta without consuming any of the green stuff, but I try to make that a little more challenging by using spinach pasta. My husband and I love it, at least. We just had it on Friday with the b. sprouts we brought home from the CSA! Ohh, thanks for passing that recipe along! My favorite vegetable–love the sound of that recipe, Aimee! I love Brussels Sprouts. I had a friend tell me once “What woman that hasn’t given birth willing eats Brussels sprouts”. This woman does. My parents fed them to me when I was younger covered in melted Velveeta cheese, and that’s how I continue to eat them. But now that I have new these new ideas (that are more healthy) I will have to give them a try. It just happens that I will be picking the ones I grew this weekend! I love what you’ve done with these brussels sprouts! I have really fallen in love with sprouts lately. I don’t love them in their original spheres, but I cut the ends off and peel them apart so I have a bunch of teensy leaves. Then I fry them that way (similar to the hash). They carmelize so perfectly, and smell so wonderful! I use them mostly tossed in with pasta. But I’m so inspired by some of these other recipes. I might have to bring the cream braised version to Thanksgiving dinner with my husband’s family. That would be so pretty, Nikki! I’m going to have to try it soon. My grandmother taught me to carve a little cross in the hard back end of the sprout. That way the heat gets in all the way and even the bigger ones get nice and soft while boiling.It turns out everyone in the Netherlands does it that way, so maybe it’s a good tip for you as well! Here we usually don’t eat the sprout until we the weather turns cold enough to achieve a little frost in the ground, because that will cause the sprouts to sweeten. That’s usually around the beginning of november. Mmm those Brussels Sprouts with Lemon & Parmesan look delicious! Must make tonight. Love your site! And I love yours! Was over there today, browsing around. Keep it up! I love Brussels sprouts in any form, but roasting them (olive oil & sea salt) has had the most success with my family. My favorite local tapas place makes a warm salad with apricots, apples, grapes, sprouts and Serrano ham that is just amazing. I lovelovelove using brussels sprouts like this. I make a salad with bacon, apples, onion, and shredded brussels sprouts every fall, and it is always a hit with family and friends. Yum! Ooooooh these recipes look so yummy! We are a huge Brussel Sprout family so I am going to give these a try! I’ve never had brussels sprouts. I saw a package of them in the store last week and almost bought them. I didn’t because I didn’t know what to do with them! I guess I need to go back and get them after all. Thanks! Perfect post for me- just bought some and needed some inspiration! Thanks. I really enjoy eating brussel sprouts, not only because of their unique flavor, but also because they are very nutritious – a superfood!